Department of Justice Inspector General Michael Horowitz testifies before the Senate Judiciary Committee. The Senate Judiciary Committee held a hearing on Wednesday to discuss the impact of a recent Department of Justice Office of Legal Counsel memo that limited how much grand jury and wiretap information its Inspector General could obtain without the permission of top DOJ officials. To settle disputes dating back to 2010, the OLC reviewed the issue and declared that, even in spite of a recent congressional appropriations effort to ensure IGs had all the information they needed to do their job, DOJ could still have veto power over whether their IG would get it. 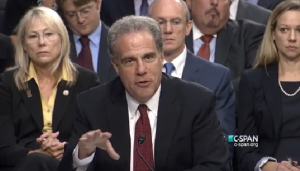 The hearing focused primarily on ongoing IG investigations, both within DOJ and in other agencies: the same kinds of access problems have been happening to the Commerce, EPA, and the Peace Corps IGs. But a discussion between Senator Thom Tillis and the two Inspectors General testifying, DOJ IG Michael Horowitz and Acting Commerce IG David Smith, revealed how the OLC decision may harm whistleblower protections, too. As Horowitz noted, the abstract legal discussion of the memo offers no clarity to government employees who might be contemplating reporting waste, fraud, or abuse to their IG. It’s nice that a bunch of lawyers can sit around and write tens of tens of pages about this issue to try and deal with the niceties of the legal issue, but we’re talking about employees throughout the government who aren’t lawyers who’ve identified waste, fraud, abuse, mismanagement, they want to come to us with information, they want us to help fix it and the risk is they have to wonder what is that 58, 62, whatever the number of pages opinion mean for me, and if I come to the inspector general for my agency will I later be retaliated against if I do that? Smith said the impact of the memo is even worse than that, given that agencies can claim whistleblowers are entitled to no protections if they hand over information which the agency claims may not be shared with the IG without formal permissions. I would agree. I wouldn’t necessarily call it retaliation because then the agency can say, “Well, you shouldn’t have given that information to the IG in the first place because it says right here in the OLC opinion they don’t have rights to it.” So there wouldn’t even be any whistleblower protection against that individual for disclosing information that we were not entitled to. DOJ claims to have no opposition, from a policy standpoint, to more forthcoming sharing with its IG. And under Deputy Attorney General Sally Yates, the sharing of information pertaining to grand jury information has improved from what it had been in recent years. But just this week, FBI continued to obstruct an IG investigation by redacting documents before turning them over. Meanwhile, some — but not all Senators — on the committee seemed amenable to finding a legislative solution to the problem. If that doesn’t happen, the OLC memo will likely have cascading negative effects throughout government, including to whistleblower protections.